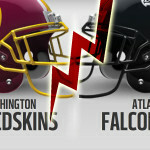 Make sure to tune in for the Atlanta Falcons vs. Washington Redskins October 11th @ 1:00 PM. You don’t want to miss the watching the 4-0 Falcons go for their 5th win of the regular season. Headed to the game? Why not book a party bus from Hot ATL Party Bus? We still have some availability for game day. While you decide which party bus will be big enough, there are a few fun tailgating games you can do on the ride down! Tabloid Read Along. Bring a bunch of articles cut from tabloids like the National Enquirer or Star. Have each of your guest read aloud to everyone else and add a little improve to it. Goes great with a beer! Ride-a-long…Sing-a-long. Separate your guests into groups. Have them draw a song out of a hat and perform it. Give them a few minutes to practice first. The best group gets a free drink! 50/50 Raffle. Collect $5.00 – $10.00 from everyone and once you reach your destination hold a raffle and the winner gets 50% of the money collected and the other can go towards the tip for your driver!